This page will guide you through configuration and basic use of the CRM Connect ODBC Add-in.It is expected that you are already familiar with the Address Book, Call History and Preview window, and the basic concepts of integration and screen popping using the Add-ins.See the 'User Guide' for these topics. The ODBC Add-in configuration is split into three groups:Connection, Fields, and Show Contact. On the Connection group, first select the ODBC data source to use from the Data source name dropdown list.You need to have created the data source from ODBC Configuration first. The connection string will be shown, allowing you to edit it if necessary. If the data source requires a username and password, enter them in the relevant boxes. From the 'Table/Query' list, select which table in the data source contains the contact data you wish to use. If you need to you can enter your own custom SQL statement in the Advanced box.You might do this for example if phone numbers are stored in a different table to the table that contains contact names and you need to do a join. The Left and Right boxes allow you to enter custom identifier quote characters. These are dependent on the type of ODBC driver your data source uses and are usually square brackets or quotes. 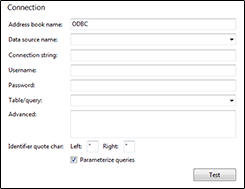 The Parameterize queries box should be left checked, only turn this off if your ODBC driver does not support parameterized queries.This is a security feature. If you want to check that you have selected the correct table or query, you can click the Test button to see the first few records from the table or query that you selected. 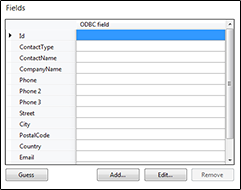 On the Fields group, you will tell the Add-in what the fields in your ODBC directory represent.For example, you might have a field in your directory named ACCOUNT_NUMBER which actually represents the unique Id of the contact. To test if the configuration worked, enter a phone number from your ODBC account into the 'Telephone' box in the 'Integration test' area and click the 'Search' button.The results will be displayed after a few seconds.